The International Venetian Film Festival in happening as we speak, beginning with a huge bash on the 28th of August, and scheduled to end this coming Saturday on the 8th of September. The previous week saw some of the biggest film stars in the world gracing the Italian city for the festival – and alongside them, some of the most glamorous looks of 2018! Whilst waiting for the results to be decided and announced – with films such as Rome, First Man, and Breathe amongst the favourites up for an award – we have been blessed with several red carpet moments, with stars such as Emma Stone and Cate Blanchett showing off their incredible beauty. And most recently, the presence and outfit that the legendary Lady Gaga wore on the red carpet for the premiere of her film A Star Is Born – alongside Hollywood heart-throb Bradley Cooper – made some brilliant waves. The singer surprised with one of the most eye-catching dresses we’ve ever seen, let alone just at this festival. Made by Valentino, this pastel pink feather dress was perfect for the artist. Tilda Swinton and Dakota Johnson also surprised at the premiere of Breathe, and livened up the red carpet with their plum and fuscia dresses. Irina Sayk, looking spectacular as ever, arrived with Donatella Versace – a moment for the past and the present, with both looking glamorous. Georgina Rodríguez, the girlfriend of footballer Cristiano Ronaldo, didn’t want to miss out either, arriving at the First Man premiere in one of the best dresses of the week – a suggestive black dress from Twinset Milano, with shoes designed by Giuseppe Zanotti. The actress Vanessa Redgrave also made a scene (in a good way! ), looking very elegant and sophisticated in her two-piece ocean blue suit. 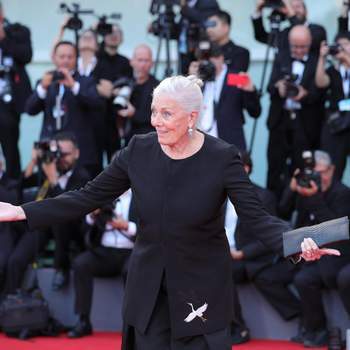 The acting veteran and cinematic icon has been honoured at the festival with the Golden Lion Award, recognised for her prestigious artistic career which gave her an Oscar for Best Supporting Actress and five further nominations.